Ontario’s agriculture ministry has patched a glitch in its wildlife damage compensation program, in which farmers’ claims risked rejection over the validity of their farm business registrations. Effective immediately for program claims assessed from Sept. 4 onward, the farm business registration number (FBRN) requirement has been changed to allow producers to apply for compensation if they have a valid FBRN number in the current or the previous calendar year, or if they have a valid FBRN exemption. Ontario farm groups had noted revised program guidelines, in place since Jan. 1 last year, had set up situations in which, for example, a producer who hadn’t paid his or her FBRN invoice by March 1, then lost livestock to predatory wildlife on March 2, would be rejected for compensation. Also effective immediately for claims assessed from Sept. 4 onward, Hardeman said Monday, the program’s pricing methodology has been updated to provide separate pricing for steers and heifers. Last year’s changes to the program guidelines have “created numerous problems, most notably… the overly strict burden of proof producers must meet to have their claim approved,” the Ontario Federation of Agriculture said recently. Standardized pricing models under the program will also be reviewed “to better reflect market prices,” the province said. The ag ministry said Monday it expects a “majority” of program changes to be introduced early next year. 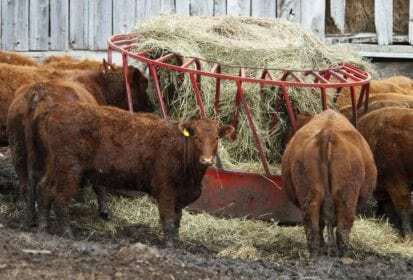 “We have heard loud and clear from our membership that the current operation of the program is producing frustrating and unpredictable results,” Beef Farmers of Ontario president Joe Hill said in a separate release Monday. OFA, BFO and Ontario Sheep Farmers jointly put forward recommendations on the program in February this year and also took part in ministry-led focus groups last winter. “Today’s announcement is a positive step in the right direction, and an important signal to farm groups that the province is serious about making meaningful program changes that ensure farmers are provided fair and responsive compensation for losses incurred due to conflicts with predators,” OSF chairman Robert Scott said Monday.